Maui was formed out of two volcanoes that were born on a hot spot on the ocean’s floor. With each eruption, the volcanoes spewed a new layer of lava and their summits eventually rose out of the water to become dry land. Over time, the volcano peaks connected together above sea level and were coated with wind-blown ash and sediment to create the island. All of the Hawaiian Islands were formed in a similar way. Hawaiian legends explain the formation of the Hawaiian Islands with some scientific truth. One story is of Pele, the goddess of the volcano, who moved from place to place in the region that is modern-day Hawaii. As she traveled, she stamped her foot, forming a new island in that place. Scientifically speaking, hot spots under the Earth’s surface form many volcanic land masses like the Hawaiian Islands. Also, Maui and the Hawaiian Islands are moving at a slow 4 inches per year in a Northwesterly direction with the Pacific Tectonic Plate. As the islands move, the hot spot stays in place, allowing it to fuel another Hawaiian volcano. So, as one island moves off the hot spot, a new island begins forming behind it, hence the creation of the Hawaiian Island chain. 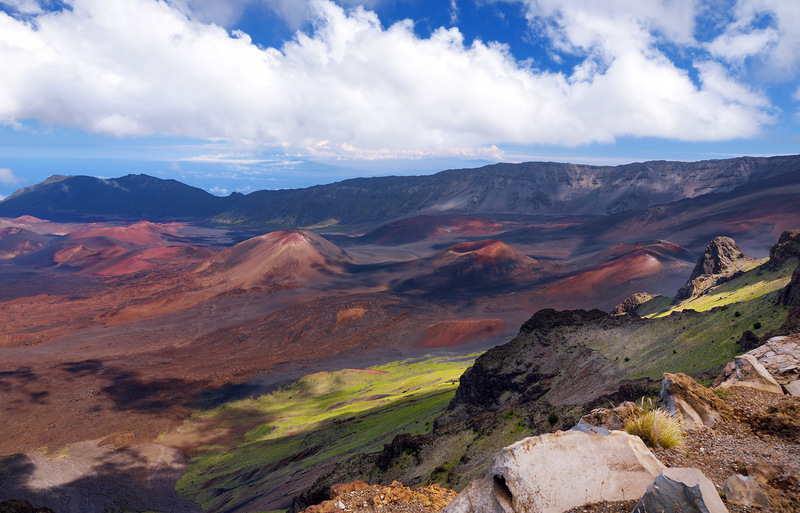 Haleakalā’s oldest lava flows date back to approximately 1.1 million years ago. Some scientists have theorized that Haleakalā was actually taller in the past than it is today, potentially reaching a peak of 15,000 feet. The mountain was shortened because of erosion from of water and landslides which lowered the mountain peak to today’s height of 10,023 feet. Haleakalā Crater sits at the top of Mount Haleakalā. It is the most popular attraction in Upcountry Maui. The erosional valley at the summit of Haleakalā is often incorrectly identified as a volcanic crater. In fact, this massive valley, which drops nearly 3,000 feet from its peak to its base, was formed when Kaupo Valley and the Ko’olau Valley connected near their headwaters. The current erosional valley formed as a result of erosion from these streams and landslides. The valley sits 10,023 feet above sea level. It is seven miles long, two miles wide, and 2,600 feet deep. The walls of the Crater are very steep and the interior looks like a barren desert. A later eruption of Haleakalā created 14 Cinder cones, which filled in most of the massive valley that had formed over time. Prior to that eruption, the erosional valley at the center of Haleakalā was nearly 6,000 feet deep which is twice the depth you see today. The 14 cinder cones are visible inside the valley when you look down into the crater. The word lava means to fall or slide in Latin. Lava is magma that reaches the earth’s surface through a volcanic vent. Magma crystallizes to form bubbles of volcanic gasses as it approaches the earth’s surface. When it erupts, it turns into lava which is made up of a slushy combination of crystals, liquid, and bubbles. When liquid lava hardens on the surface, the process is called freezing. This frozen lava becomes volcanic glass. Haleakalā is a giant shield volcano which means that when it erupts, lava will slowly flow out of vents located along the volcano’s rift zones rather than flying up into the air. Haleakalā is made of one of the most common varieties of lava, basalt. The temperature of lava can be discovered based on its color. A bright orange color indicates that the temperature is above 1,000 degrees Celsius while a dark red color is cooler at about 650 degrees Celsius. There are two types of lava found in surface lava flows, and they are easy to tell apart. 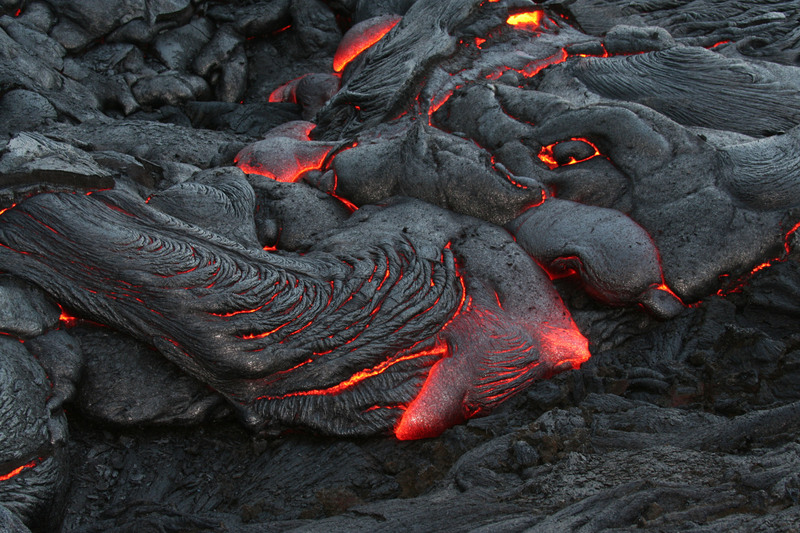 Pāhoehoe is a smooth ropy lava, and ‘A’ā is a sharp, jagged lava. These Hawaiian names have been adopted worldwide to describe these two types of lava. About the Author: Skyline Hawai’i offers unforgettable tours for the lover of natural beauty, the adventurous thrill-seeker, and everyone in between. Let us show you what the Aloha spirit is all about. For more information or to make your reservation today, visit: www.skylinehawaii.com.